TALLAHASSEE — Florida Agriculture and Consumer Services Commissioner Charles H. Bronson is urging horse owners to get their animals vaccinated following an upsurge in the number of Eastern Equine Encephalitis cases. Sentinel chickens that serve as an early warning of the existence of the disease are also being diagnosed with EEE in areas of the state that are not usually affected. So far this year there have been 16 confirmed cases of EEE in horses. While that is not an unusually high number, seven of the cases were reported on Wednesday, June 23, from counties scattered throughout the state. 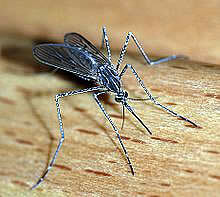 EEE is a viral disease that affects the central nervous system and is transmitted to horses by infected mosquitoes. Signs of the virus include fever, listlessness, stumbling, circling, coma and usually death. 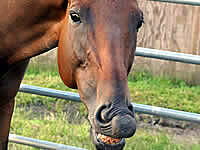 The disease is fatal in horses in 90 percent of the cases. Bronson says the majority of cases of EEE and other mosquito-borne diseases can be prevented through proper vaccinations. Horse owners are urged to check with their veterinarian to make sure their animals have received current vaccinations and booster shots against EEE and West Nile Virus, and that these shots are kept up to date. TALLAHASSEE — With the arrival of spring and warmer weather, Florida Agriculture and Consumer Services Commissioner Charles H. Bronson today reminded horse owners to get their animals vaccinated for mosquito borne diseases. 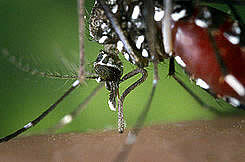 The two principal equine diseases associated with mosquitoes are Eastern Equine Encephalitis (EEE) and West Nile Virus (WNV), and the majority of cases of each can be prevented with proper vaccinations, according to animal health officials. “The key is to make sure that a horse has been vaccinated against these mosquito-borne diseases and to check with your veterinarian to determine whether an animal’s booster shots are up to date,” Bronson said. TALLAHASSEE — Florida Agriculture Commissioner Charles H. Bronson this week is promoting the awareness of prescribed fire’s vital role in maintaining the health of Florida’s forests and other natural areas, as well as protecting the safety of the state’s residents and visitors. OCALA — Florida Agriculture and Consumer Services Commissioner Charles H. Bronson today announced the completion of an innovative bioenergy project that helps manage animal waste while at the same time producing energy and agriculture products. Bronson joined a host of public officials and industry representatives at the demonstration of a bio-energy plant owned by Sigarca, Inc., and located at the Southeastern Livestock Pavilion in Marion County. The facility processes horse manure into renewable energy, organic soil and soil tonic (bio-fertilizers) and gives Florida’s substantial equine industry an environmentally superior method of disposing of animal waste.